Northern Caribbean University (NCU) won the 2018 International Business Model Competition (IBMC), during this year’s event held in Provo, Utah, United States, May 10-11, 2018. The win is no small feat for NCU Team Beasc Tech in that the IBMC had 5,000 competitors from 500 Universities from 30 countries worldwide. The team was awarded the “Traveling” trophy along with a cash prize of US$30,000. 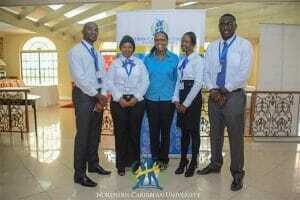 NCU Business Model teams have dominated the local competition since its inception having won four times consecutively. This year, the NCU teams finished third and fourth locally but came up winners at the IBMC level, which evaded them in the previous years when they won the local competition. Beasc Tech is a technological device that incorporates the use of a pheromone receptor that traps the pest at the moth stage and uses high voltage electricity to kill them, explained Hazel Wright O’Connor, team coach and executive director of the Morris Entrepreneurship Center. His company provides business support services to micro, small and medium-sized enterprises in Central Jamaica and beyond. “What makes this device special is that it incorporates the use of solar energy and is an entire smart farm system,” said O’Connor. The system uses sensors to detect the threat levels of the pest on individual properties, allow farmers to remotely access their farms thus preventing occurrences of praedial larceny using motion detection, allow farmers to collect geo-data, so they can check rainfall levels, humidity, soil type, and more, explained O’Connor. “The device is a completely integrated approach to pest management and can be customized to attract specific moths so that it does not destroy the insect eco-system but targets specific pests,” said O’Connor. Beasc Tech will help farmers fight the war against the ravaging “Beet Armyworm” a pest which is demolishing hundreds of acres of farms mainly in St. Elizabeth and other parishes throughout Jamaica. The pest is a threat to the nation’s food security, and further validations showed that this tiny insect and its relative the “Fall Armyworm” are causing chaos in other countries such as Nigeria, Ghana, South Africa, Australia, Brazil and the Southern States in the United States. Members of the Beasc Tech team are Lancelot Riley, Jermaine Smith, Bescekia Nembhard and Amina Muhammad. The IBMC is designed to encourage and promote creative and innovative thinking among university students and to foster and nurture the growth of the local entrepreneurial industry. Riley shared the team’s plans for the future. “We will move to commercialize the business. The broader vision is to automate farming so that developing countries can become more competitive in the global market,” he said.